Happy Cupcake Thursday! I tried to stamp a little yesterday and my back/neck bothered me so much that I had to stop. So, I tried again this morning, and I managed to finish a card! Yea! I think I will need to ease back into it, though... I needed a thank you card for a friend of mine and I didn't want to just pull one from my stash (she would know.. LOL!). I used Taylor's sketch, TECC66, from last Friday. I stamped and colored the cuppie friends, then cut them out and popped them up with foam tape. 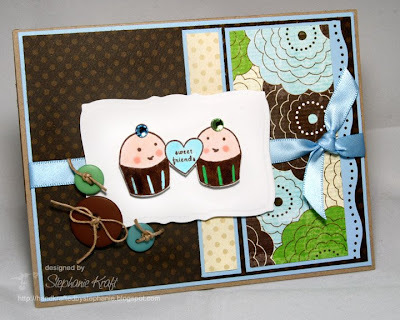 Accessories: Curved Rectangle Nestabilities (Spellbinders), Cuttlebug (Provo Craft), Markers (Copic), Dotted Wave punch (EK Success), Rhinestones (Kaisercraft), Buttons (Bo Bunny), Ribbon, Foam tape, Twine.